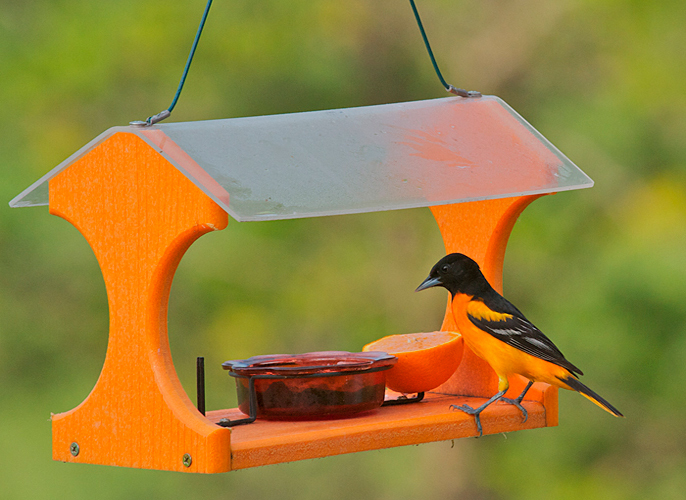 This spring, the orioles have gone ape over the grape jelly. They like the oranges, too. This morning Lord Baltimore was hopping around the dish and poking into it, trying to get one last lick of jelly from the empty dish. Of course, I dashed out to refuel the feeder with jelly and a fresh orange. By the time I got back to the house, the bright orange bird had already returned and was alternately slurping up jelly and orange. It's nice to have one's gifts so sincerely appreciated. This spring our jelly feeder is also attracting orchard orioles, to my great delight. Where Birdwatching Dot Com is, in southeast Iowa, they are far less common than Baltimore orioles. With chestnut red in place of orange, the male orchard oriole is less flashy than the Baltimore, but to me he's every bit as lovely. Orchard orioles are noticeably smaller than Baltimores. At our Grape Jelly Oriole Cafe, the Baltimore orioles seem to get first dibs at the jelly. 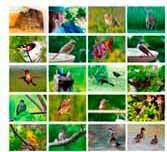 However, orchard orioles don't go without. They wait until the feeder is unoccupied, and then they come in for their share. Oriole Grape Jelly Cafe stays nice, doesn't warp or crack, is completely washable, and is made from plastic bottles that otherwise might have been added to the landfill.